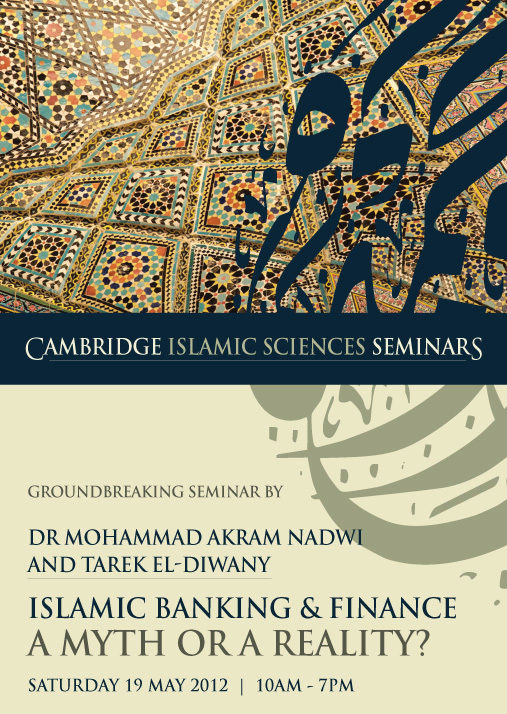 Cambridge Islamic Sciences: Islamic Finance - A Myth or A Reality? Islamic banking and finance is a trillion dollar industry and its players include major global banks and financial institutions as well as regional banks in Muslim countries. It has come a long way, from its beginnings in the ‘60s to where it is now, even being proposed as an alternative to conventional finance. Notwithstanding its growth and popularity, Islamic finance is not without controversy. There are fundamental issues that still need addressing. This seminar "Islamic Banking & Finance - a Myth or a Reality?" will take a critical look at the approach, foundations and development as well as the application of modern Islamic finance from more than a purely 'shariah-compliant' or juristic perspective to explore whether it is in keeping with the spirit and the objectives of Islam in addition to the shariah principles. This is a first-of-its-kind essential seminar for finance professionals, scholars, students, businesspeople and Islamic-finance-consumers in particular as well as for anyone who has some interest in this field. No prior knowledge is required to attend. Shaykh Dr Mohammad Akram Nadwi is from the Indian city of Lucknow and a graduate of the world renowned Nadwatul Ulama where he studied and taught Shariah. He has Ijaza (licenses) from many of the most renowned scholars of our time including Shaykh Abul Hasan Ali Al-Nadwi, Shaykh Abdul-Fattah Abu Ghuddah and Shaykh Yusuf Al-Qaradawi. He has authored and translated over 25 titles on Language, Jurisprudence, Qur'an and Hadith, including a monumental 57-volume work on the lives of female scholars in the Islamic History. He is currently a Research Fellow at the Centre for Islamic Studies, Oxford University and is widely recognised as one of Western Europe’s leading Islamic scholars. Tarek El Diwany graduated in Accounting and Finance from Lancaster University in 1985. Tarek has worked as an interest rate derivatives dealer in the government bond market, and as head of Islamic finance for a major financial institution based in London. In 1997, he completed the first edition of The Problem With Interest, and in the same year launched www.islamic-finance.com, where he is now the Editor. He is a frequent speaker on Islamic finance at conferences throughout the world.